Products come in packages of 300g. 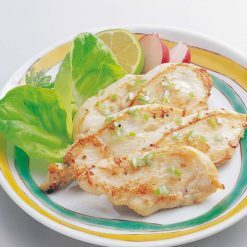 The sliced ​​chicken breasts were marinated in a salty sauce. Green onions are also known commonly as scallions or spring onions. They contain a wide variety of health-enhancing compounds such as vitamins, minerals and phytochemicals. Green onions are often used in cooking as a garnish but have great health benefits, raw or cooked. Green onions are a surprisingly rich source of vitamin K, vitamin C and vitamin A. Vitamin K has been known as a crucial vitamin for the growth, development and maintenance of strong bones. Vitamins C and A are both known to have strong antioxidant properties, which means that through inhibiting the activity of free radical compounds, they help prevent DNA and cellular tissue damage. Diets rich in high antioxidants are linked to a decreased risk of heart disease. Vitamin A is also necessary for the body to produce rhodopsin, a protein in the eye. This sauce burns easily. Please use caution while cooking. Thaw in refrigerator and then saute.Please thaw the meat in the refrigerator, then heat the meat after pouring a thin layer of oil in a frying pan. When the oil is hot, arrange the thawed chicken in the pan so that none are touching. Lower the heat and place a lid on the pan. Please make sure that the chicken meat is thoroughly cooked before consumption. When cooking, please pay close attention not to get burned, because the equipment and the product will get very hot. 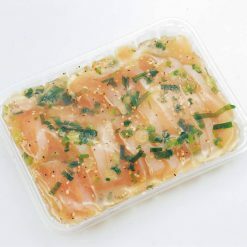 This product contains chicken breast meat (domestic), syrup, green onions, vinegar, salt, spices, sesame oil, yeast extract, agar, sesame, fish extract, alcohol, thickener (xanthan gum). This product is not suitable for anyone with allergies to chicken, sesame or contamination. Origin of ingredients: chicken (domestic), green onions (China). Prepared and packaged in Japan.